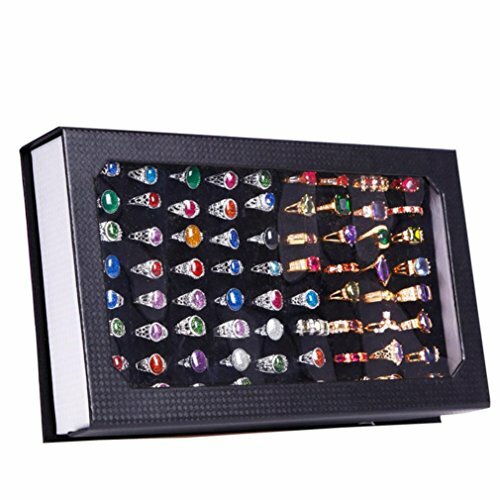 Novel Box Premium Glass Top Display boxes are designed to help showcase and portray items so they stand out. Made with real glass, all of our Black Leatherette boxes come with metal clasps in the front and metal hinges in the back. Their compact size makes them ideal for travel and the metal latch keeps your items in a secure atmosphere free from dust. Depending on the item you want to display, we offer our glass top display boxes in 2 different sizes. Large: 14.75" X 8.25" X 2.1" and Half-Size: 8.25" X 7.25" X 2" with ring inserts available in 7 colors - Black (Large and Half Size), White, Blue, Burgundy, Red, Pink and Gray. The ring foam pads are topped with plush felt and can hold small and large rings as well as cufflinks. 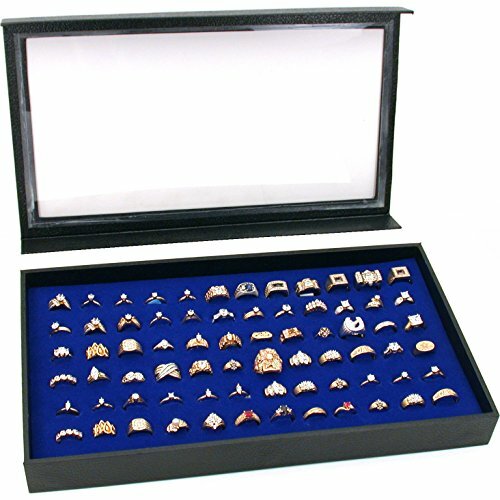 These display boxes and ring inserts are great for personal use and showcasing jewelry. Trays can be easily removed and placed on a countertop for better display. The Glass Top Box can also be purchased separately or with gem/jar/specimen inserts. Please see our other Amazon listings to purchase these separately. The Glass Top Box can also be purchased separately or with gem/jar/specimen inserts. Please see our other Amazon listings to purchase these separately. 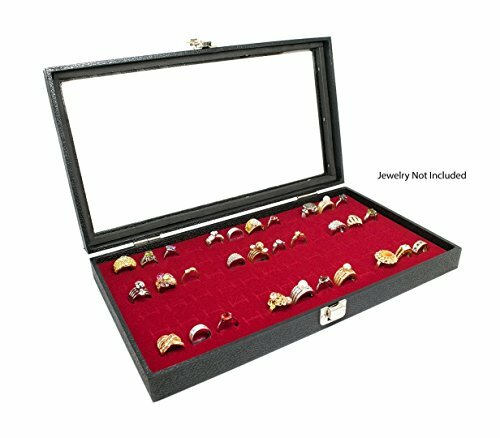 Pocket Watch Display Case Storage Box For 18 Watches. Black Display Case. 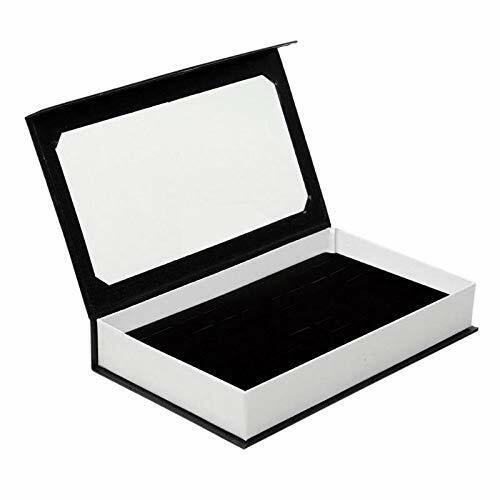 This is a new black jewelry case display box with an acrylic magnetic lid. This will hold all of your loose stones, beads and coins. The box has a magnetic lid. The case measures approximately 14 3/4" x 8 1/4" x 1" (37.4 cm x 20.9 cm x 25 mm). Blue Foam Ring Display Tray Insert. This is a new blue foam ring display tray insert pad that holds 72 rings. 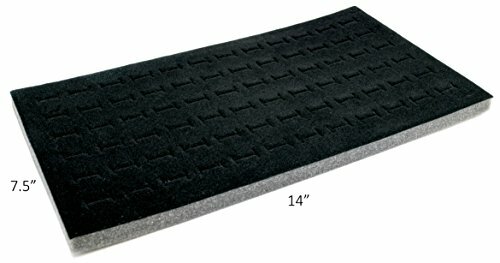 The top of the foam pad is blue felt. At shows it is great for showing your sample line display. This tray is fantastic for travel by keeping the rings organized. 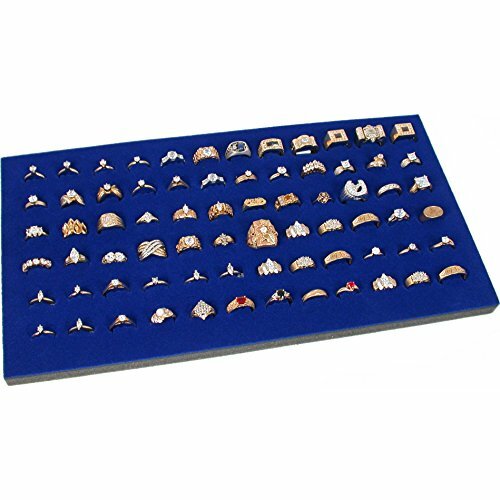 Easily remove the tray from the showcase to allow customers to view your jewelry from the countertop. It measures approximately 14 1/4" x 7 3/4" x 1/2" (36.1 cm x 19.6 cm x 12 mm). Novel Box Premium Glass Top Display boxes are designed to help showcase and portray items so they stand out. Made with real glass, all of our Black Leatherette boxes come with metal clasps in the front and metal hinges in the back. Their compact size makes them ideal for travel and the metal latch keeps your items in a secure atmosphere free from dust. Depending on the item you want to display, we offer our glass top display boxes in 2 different sizes. Large: 14.75" X 8.25" X 2.1" and Half-Size: 8.25" X 7.25" X 2" with ring inserts available in 4 colors - Black (Large and Half Size), White, Blue, Red and Gray. The ring foam pads are topped with plush felt and can hold small and large rings as well as cufflinks. 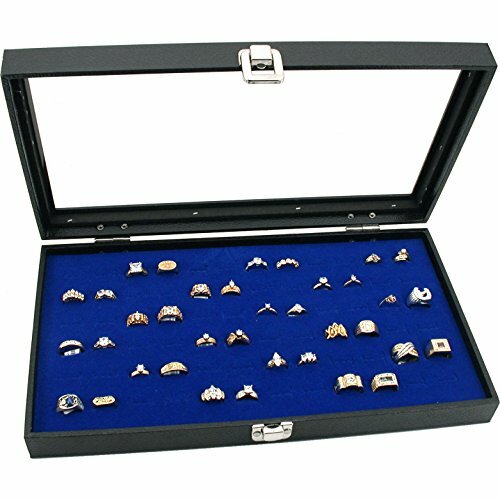 These display boxes and ring inserts are great for personal use and showcasing jewelry. Trays can be easily removed and placed on a countertop for better display. To help you keep your glass display clean, a free large Novel Box cleaning cloth is included. The Novel Box Stackable Wooden Utility Tray is made from engineered wood and then wrapped with an embossed leatherette covering. 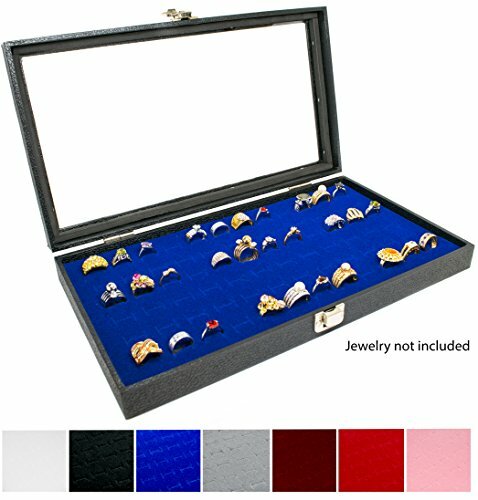 These Jewelry trays come with 72-ring foam pads that are topped with plush felt fabric and are available in 5 colors - Red, Black, Blue, Gray and White. Choose from sturdy vinyl covered Wood or Plastic trays. Trays are also available with Gem Jar inserts (see other listings). Looking for more Display Case 72 Blue Ring similar ideas? Try to explore these searches: Gardenia Honeysuckle Eau De Toilette, Winter Polar Fleece, and Danskin Womens Tank Leotard. Look at latest related video about Display Case 72 Blue Ring. Shopwizion.com is the smartest way for online shopping: compare prices of leading online shops for best deals around the web. Don't miss TOP Display Case 72 Blue Ring deals, updated daily.